We know that this is a hefty investment so you don’t want to spend a bomb on LED grow lights that don’t work for you. That’s why we’re here to help you with our buyer’s guide to the best LED grow lights 2018. To help you out, we have categorized our list of best LED grow lights by different budget categories. Depending on how much you can afford, each one of these could be the best LED grow lights for your money. The P150 offers the full 12-band light spectrum from ultraviolet to the upper infrared. This is truly about as close to sunlight as you can get with indoors LED lighting. The LED lamps within the P150 ensures that the intensity of the light emitted remains constant. Coverage wise, the P150 offers a maximum of 4.5ft by 3.5ft area coverage when suspended at 18 inches above the growing area. Its core coverage is 3ft by 1.5ft. This means that the P150 is able to cover up to 4.5ft by 3.5ft during the sprouting stage of your plants and 3ft by 1.5ft during the flowering or blooming stage where the plants need more intense light, which reduces the coverage area. With its integrated 90-degree secondary focusing lenses, the P150 is able to provide deep light penetration to focus the light on the covered area. Another cool feature of the P150 is its selectable veg/flower switches to ensure that your plants get the appropriate type of lighting for the particular growth stage that they are in. At a price range under $300, this LED grow light certainly doesn’t come cheap. What makes up for the relatively high upfront cost is its great energy efficiency. Unlike conventional white LEDs and High-Intensity Discharge (HID) lights, the P150 LED grow light uses less than half the electricity and heat to produce the same growing power. Its photosynthetic active radiation (PAR) per watt is much higher. In fact, the P150 can provide the same light intensity of a 250-watt High-Pressure Sodium (HPS) lamp and only use 86 watts. This is thanks to Advanced Premium Series’ proprietary, auto-switching 110-volts/220-volts LED drivers which provide maximum output with as little input as possible, with the flexibility to adapt to any global voltage output. To top it all off, the P150 also comes with a five-year warranty as well as a 90-day money back guarantee. We like that the P150 offers great versatility for worldwide use, full light spectrum with veg/flower switches and one of the more well-covered warranties. For the Best LED Grow lights under $300 category, the P150 is certainly amongst the best LED grow lights. 2018 reviews of this product have been mostly positive, a reflection of Advanced Premium Series’ consistency and reliability when it comes to its LED grow lights. 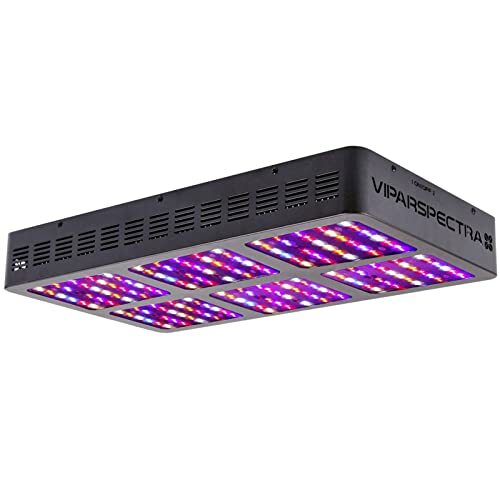 The VIPARSPECTRA Reflector-Series 900W offers the full spectrum of light that supports plant growth throughout the different phases of its growth cycle. With its scientific engineering to maintain a balance between high PAR/Lumen and optimal coverage, you don’t have to worry about the light being too concentrated in the center of your grow space, resulting in stunted plant growth and overheated plants from underexposure or overexposure to light, depending on where the plant is located. Coverage wise, this LED grow light offers a maximum coverage of 4.5ft by 4.5 ft at a ceiling height of 24 inches and a core coverage of 3.5ft by 3.5ft at the same ceiling height. This is pretty comparable to that provided by the P150 and in fact slightly larger. Another useful feature of this VIPARSPECTRA model is its innovative aluminum cooling heat sinks and high-speed quiet cooling fans, which enable the LED grow light to run at least 70% cooler than comparable HID lighting. Besides this, the VIPARSPECTRA LED grow light is also energy efficient. It is comparable to the conventional 1000-watt HPS lighting but only consumes 418 watts. Warranty wise, this LED grow light comes with decent coverage with a three-year guarantee and a thirty-day satisfaction or return guarantee. While its warranty period may not be as good as what’s offered under the P150, the VIPARSPECTRA LED grow light still ranks among the best LED grow lights. Reviews tout its full light spectrum capabilities, good area coverage and its great features to ensure that the growing space does not end up having an uneven distribution of light intensity and become overheated. That said, it is slightly pricier than the P150. If you agree with us that the VIPARSPECTRA LED grow light is one of the best LED grows lights, 2018 might be a good time for you to take advantage of the current offer! 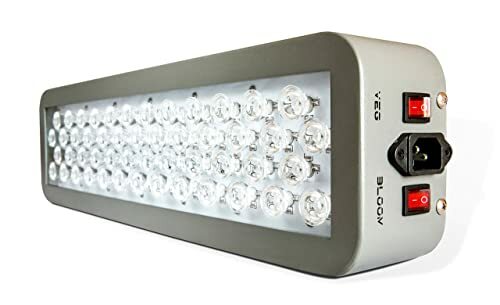 The Galaxyhydro 300W LED grow light is the most inexpensive LED grow lights that we have reviewed under $300 category. Of course, with a lower price tag, you’re bound to expect some differences compared to other LED grow lights in the same price category. Starting off with the spectrum of light, the Galaxyhydro 300W LED grow light offers a nine-band light spectrum, fewer than the light bands offered under P150, but sufficient for the optimized growth of most plants, vegetables, and flowers. Its nine-band light spectrum includes a seven to one ratio of red to blue LEDs, plus ultraviolet and infrared. 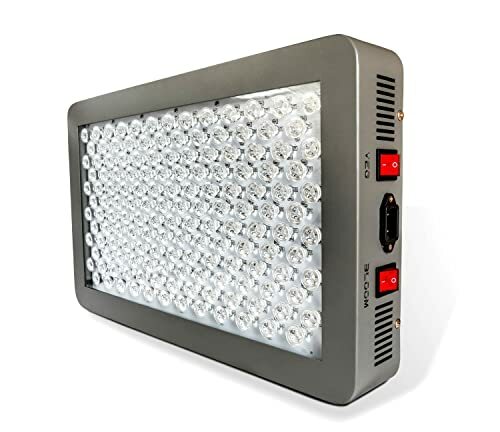 In terms of the coverage, this LED grow light is ideal for a 2ft by 2ft grow space with a ceiling height of 18 to 25 inches and it is intended to be daisy-chained. This means that you should probably get two to three of this LED grow light and link them up like Christmas lights so that you can cover a larger grow space. Would this count among one of the best LED grow lights? 2018 reviews seem to indicate that this would depend on your purpose of use. According to an updated review, the Galaxyhydro 300W LED grow light works amazingly well for the flowering stage but pales in comparison when it comes to the vegetating stage. The user suspects that it might be due to the lack of blue light from the Galaxyhydro 300W LED grow light and this can be supplemented by installing other lights that emit more blue light. That said, this LED grows light is currently available at a great price. It also comes with a two-year warranty and a thirty-day money back guarantee. It may be worth your while to consider this deal for a decent LED grows light that is relatively affordable. We wouldn’t say that it tops the under $300 category, but it’s definitely the most economical buy! All LED grow lights in the Advanced Premium Series tout the use of innovative full-spectrum technology that will help keep your grow space and the plants cool while fulfilling their light needs. The P300 is no exception. Like the P150, the P300 boasts of all of the manufacturer’s trademark features: two to three times the light intensity of other competing LED lights, a 12- band light spectrum that mimics sunlight, customizable veg/flower switches, and if we forgot to mention earlier for the P150, its virtually silent and high-speed fans with improved cooling heat sinks. Now you’re probably wondering about the price premium you are paying for the P300 since it costs at least a third more than the P150. The difference mainly lies in the P300’s wattage and energy efficiency. The P300 can replace a traditional 400-watt HPS lamp and for the equivalent energy produced, only consume 180 watts of power. So, you can generate higher light quality and intensity for a lower price. So instead of getting two P150, you can just use one P300 to provide the level of light quality and intensity that you want for less than double the price of a P150 (which would be the price of two P150 LED grow lights). Higher wattages also mean that the P300 is able to cover a larger grow room. Like the P150, the P300 comes with a five-year warranty and a 90-day money back guarantee. If you are comfortable with moving your budget to the under $500 category, the P300 might be a better choice for the best LED grow lights than the P150. California Light Works Solar Flare LED grow lights provide industrial strength LED lighting at an affordable price range that is under $500. This particular 220W model is designed to cover a 2ft by 2ft area during the flowering stage and a maximum area of 5ft by 5ft during the vegetating stage. During vegetative growth, the manufacturer recommends that you place the LED grow light approximately 4 feet above the grow tent. To help you cover larger areas, the California Light Works Solar Flare 220W LED grow light is also designed such that several units can be chained up to increase area coverage. Up to 10 of these units can be chained together and powered from the same power plug. Unlike LED lights that use three-watt chips, this LED grow light uses five-watt LED light emitters instead, and a total of 44 of them in one LED grow light, which is why it is able to emit more intense LED light. It offers a patented OptiGrow® Spectrum to provide the optimal light bands for plant growth and its primary lenses are made of jewel-grade glass that is uniformly focused at 90 degrees. The California Light Works Solar Flare 220W model comes with a three-year warranty. What makes this rank among the best LED grow lights? Reviews have praised California Light Works for their no-nonsense policy when it comes to handling returns and replacements. And it seems from the many reviews that this LED grows light works pretty well for the majority of the customers. Not all wavelengths are equal, so a LED grows light that offers fewer light bands in its light spectrum is not necessarily inferior to another. This is indeed the case with the G8LED 240W LED Grow Light. This LED Grow Light has been crowned the “2016 Best LED Grow Light” by HIGH TIMES Magazine. Its eight-band wavelength ratio is highly optimized and includes infrared and ultraviolet to help you set up the most efficient LED grow light system. For the 240W model, the coverage of vegetation or flowering is the same at 3ft by 2 ft. This LED grow light has also been designed to work internationally at 110V or 240V. 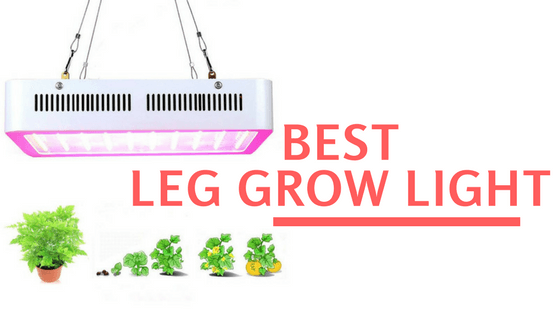 Of particular mention is this LED grow light’s design to maximize the yield during different stages of a plant’s growth cycle without a veg/flower switch. Instead of switching off didoes during the plants’ vegetating stage, the manufacturer believes in the use of lights to their highest capacity with the add-on of 90W reds. Another amazing feature is this light’s ability to stay cool even after 24 hours of uninterrupted use. 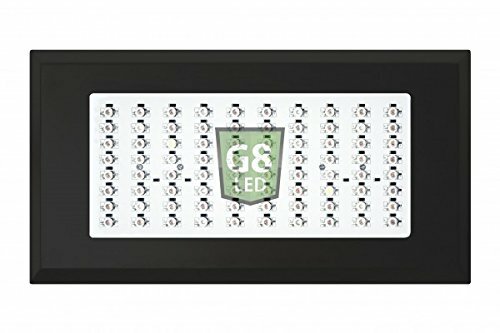 At under $500, this LED grow light comes with a two-year warranty that is serviced directly by G8LED. Judging from the reviews online, it seems that most customers have been very satisfied with the performance of the G8LED lights, as well as the customer service. G8LED is also quick to respond to any customer comments on Amazon, which speaks volumes about the manufacturer’s commitment to addressing customer issues. Suffice to say that this is indeed one of the best LED grow lights that you should consider in 2018! Moving up the price scale, we have the Solar Storm 440W LED grow light from the same manufacturer that brought us the Solar Flare 220W model. The difference? The 440W model comes with 88 five-watt LED emitters, twice the number in the 220W model, to emit more intense LED light. With higher wattage, this also means that this 440W LED grow light by California Light Works can provide a higher area coverage: 3ft by 3ft during the vegetating stage as compared to 2ft by 2ft from its Solar Flare 220W cousin. Other unique features include a switch that allows you to alter the light spectrum from veg to bloom mode and the supplemental built-in UV-B bulbs in this LED grow light. You can enjoy power savings when you switch to a veg mode that is more suitable for vegetative growth and maximizes the intensity and your yield when you switch to bloom mode. With the UV-B bulbs, the Solar Storm 440W LED grow light helps to increase the yield from your harvest when the bulbs get switched on during the last few weeks or the last phase of your plants’ growth cycle. A three-year warranty is included too. California Light Works is a reputed brand and many customers have given positive feedback on the quality of the LED grow lights as well as the responsiveness of the manufacturer’s customer service. This is why we have listed it among the best LED grow lights under $1,000. This has got to be one of the most expensive LED grow lights that we have reviewed. 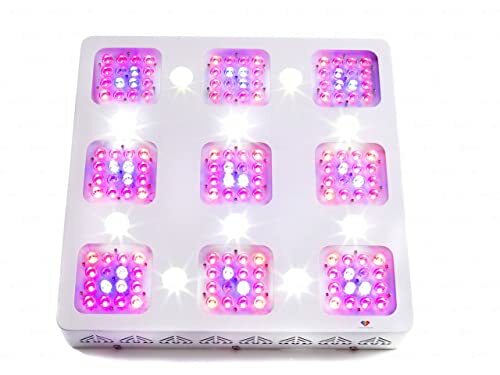 At close to $1,000, this is serious money that you will be forking out so this LED grow light has got to be worth its price tag. And worthy it is, if we were to trust the online reviews that have nothing but praises for this LED grow light. Advanced LED Lights continues to show their dedication to innovation with their most recent Diamond Series and the XML 350 certainly deserves a spot on our list of the best LED grow lights. This LED grow light features three-watt and ten-watt CREE single-chip LEDs that are super energy efficient: they literally provide maximum light for a minimal amount of electricity. For better comparison, you can consider the XML 350 LED grow light to be a good replacement for 600-watt HPS lamps. Using the latest LED drivers, the XML 350 LED grow light maintains good control overcurrent. Coupled with its oversized dual heat sinks and good ventilation, the XML 350 LED grow light purportedly dissipates heat 50% better than other competitor LED lights. All these contribute to a longer running life, i.e. durability for this LED grow light. In terms of the light spectrum provided, the XML 350 LED grow light has an output that matches closely to the light spectrum regions that are highly required by plants, which is why this LED grow light works really well throughout the different stages of a plant’s typical growth cycle. It provides a full spectrum of about 11 wavelengths worth of color output. 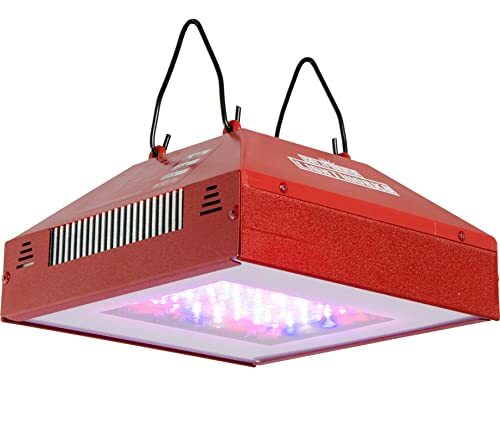 To minimize light wastage, this LED grow light is equipped with advanced LED collimator lenses that channel the light directly and deep into the plant canopy. It has a total maximum coverage of 4.5ft by 4.5ft and a core coverage area of 4ft by 4ft. To top it all off, it comes with a three-year hassle-free warranty. 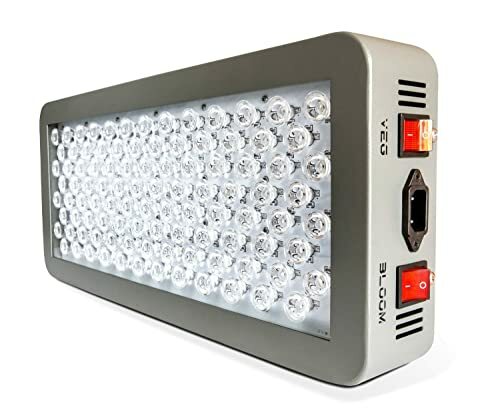 If you can get past the expensive price tag and you value the long-term benefits of this LED grow light, the XML 350 LED grow light is a great investment that’s worth every buck. The Advanced Platinum Series of LED grow lights are so good that different models have made it to our list of best LED grow lights! The P450 is the perfect replacement for a traditional 600-watt HPS lamp and consumes only 250 watts of electrical power for the same output. For the higher wattage, it provides good light coverage for larger indoor grow spaces, hydroponic trays, small to medium and even larger tent grows 4.5ft by 3.5ft (maximum coverage) and 3ft by 1.5ft (blooming coverage). Cementing its status as one of the best LED grow lights, 2018 reviews indicate that customers are mostly pleased with the performance of the P450, calling it a premium product that delivers its promises. This is also considerably cheaper than the other big brothers in the under $1,000 category with the likes of California Light Works and Advanced LED Lights. So, if the price is an important factor, the P450 can be the best option of the three when it comes to the right LED grow light for you. To select the best grow light, you will need to consider a number of factors. First, how big is the area that you need to cover? Your grow light should be sufficiently powerful to cover the entire area where you grow your plants. Consider the size of your grow room, including the height and footprint of the space. You will notice that most manufacturers provide a “core coverage” number for the LED grow light, which refers to the grow space area that the light is able to cover. 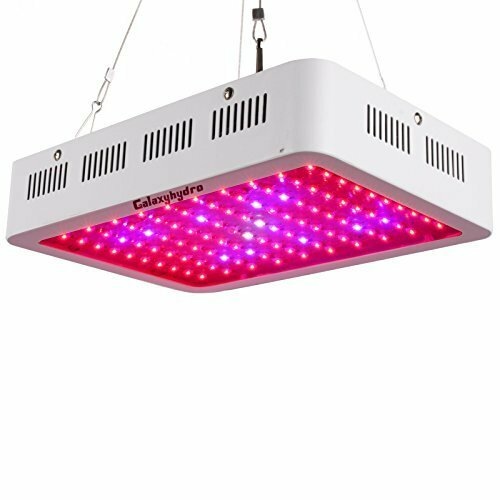 There are some good guidelines on websites like Plantazoid that suggest the ideal type of LED grow light depending on the size of the grow room. You should also consider how many LED grow lights you will need and how they should be placed to maximize coverage. As a general rule, to increase space coverage, you should place more lights adjacent to each other. Next, what are you growing? Depending on whether you are growing green crops, bushes, trees, etc., you may want to select particular setups that would be most conducive for the plants that you are growing in your grow room. All LED grow lights that are full-cycle will be able to grow plants from the seedling stage to the flowering stage. However, some LED grow lights are specifically designed for certain types of grows. One good example would be LED grow lights that are designed to grow cannabis. There are also LED grow lights that are designed for the indoor gardener when it comes to growing fruits, vegetables, and even flowers. The type of LED grow light is also important. As you may have realized by now, there are different types of LED grow lights that you can choose from. Lights that are tailored for growing cannabis and vegetables can have various options in terms of the accompanying features. For example, there are LED grow lights that include single channel lights (on or off), or two channel lights that have a vegetable and bloom mode, and lights that can be programmed to set your preferred light schedules and even customize the spectrum and intensity of the lighting. Programmable LED grow lights are considered one of the best LED grow lights. Reviews will tell you that these are among the advanced versions that make growing your crops close to effortless. Using LED grow lights because they are supposed to have long useful lives? Well, yes, but that doesn’t mean you should ignore the warranty provided and the reputation of the manufacturer. Don’t just take the manufacturer’s word for it, read the fine print. Given the large upfront investment that comes with acquiring LED grow lights, you don’t want to end up with the lights breaking down within months and having no recourse because you forgot to check if there was warranty. A reliable warranty will help to cover costs of replacing parts and possible repairs down the road, usually, five to six years after you have purchased and used the LED grow lights. Make sure that you get to benefit from the long-term savings that supposedly come along with the best LED grow lights. Reviews will indicate whether the manufacturer is a trustworthy supplier who honors the warranty provided for the product. Last but not least, your budget is also an important factor when it comes to selecting the best LED grow light. Obviously, high-quality LED grow lights come at a price. Consider the budget that you are willing to spend, and possibly the potential income you may get from your business if you are growing for profit, and work backwards to decide on the best LED grow light that will be value for your money. If you have done some research online, you may be wondering why everyone seems to be touting full-spectrum LED grow lights. There’s some science behind this, but we’re here to break it down so that it’s easier for you to understand some of the reasons why full-spectrum LED grow lights are considered the best LED grow lights. Ever wondered why many farmers still prefer to plant outdoors where possible? This despite land scarcity, exposure to the elements, etc.? Well, it turns out that sunlight plays a huge part in this. Sunlight offers the whole spectrum of visible light which is important because many plants require different colors of the light spectrum during different growth stages. If you only use a certain type of LED grow plant, it’s likely that your plants will not have the appropriate color spectrum for one of the growth stages. Blue LED lights, for instance, may be great when it comes to encouraging vegetative growth, think plants that grow tall and leafy, but they aren’t so useful if you are at a stage where you want your plant to bud and flower. In fact, this is where blue LED lights alone may result in not so ideal situations where your plants turn out to be busy with minimal buds that can eventually flower. Red LED lights, on the other hand, are really beneficial for the budding and flowering of plants, but this alone is also not sufficient if you want your plants to eventually grow tall and healthy. That said, you may think that it will be fine for you to just get red and blue LED lights. Well, that’s not the end of the story. While there’s different views on the value of ultraviolet light, there has been some research that suggests that the use of ultraviolet light in short bursts can help to boost THC production, i.e. increase the potency of the growing cannabis. As for white LED light, it isn’t particularly helpful to the growth of the plants, but in an indirect way, it helps you, the grower, better see and resolve any potential problems in your grow room. These aside, research also suggests that plants are used to growing with the full spectrum range that’s available from sunlight, which is probably why the isolated use of blue and red LED grow lights may still not be an ideal way about it. Since full-spectrum LED grow lights mimic real sunlight, it is probably best to use them in your grow room to achieve the best possible outcome. This is also why all of our recommended LED grow lights below are full-spectrum LED grow lights or at least LED grow lights that come with some combinations of the different spectrums that are essential for particular crops they are designed for. Now before you head out there to buy LED grow lights, this section is worth a read if you don’t have a good understanding of LED grow lights. If so, some of the terms we’ve used to describe the LED grow light features above may not be things that you are familiar with. To clear the air, here are some Q&A that we hope will be helpful for you. LED stands for light-emitting diode. It is what we call a “solid-state lighting technology”, also known as SSL. In essence, an SSL gives out light from a piece of solid matter. This is unlike an incandescent bulb which gives out light from a vacuum or a compact fluorescent light which gives out light from gas. LED lights have come a long way from their humble beginning as indicator lights on electronics. Today, they are a popular choice of lighting because of their many favorable qualities: power efficiency, relatively long lifespan (around 50,000 to 100,000 of hours compared to other lights which need to be replaced after about 20,000 hours of use) and lower heat dissipation (they can remain cooler compared to other lights). This is also why LED lights have become a favored choice for grow lights, which are lights used specifically for growing plants, think horticulture and even food production like hydroponics. An LED grow light is basically an artificial source of light to cultivate plants indoors. It makes up for the lack of sunlight available to the plants indoors by mimicking sunlight or providing the light spectrum needed for the plants to grow. LED grow lights can be used for industrial or household purposes. As mentioned earlier, LED works by emitting light through a piece of solid matter. LED grow lights work by sending an electric current through a semiconductor material. Doing so excites the electrons and this results in a powerful light being emitted from a relatively small bulb. Depending on the materials used for the semiconductor, you can create LED diodes that emit various wavelengths of light. This allows you to provide your indoor plants with the different light wavelengths that they need for every stage of growth. There are many benefits to using LED grow lights and we have highlighted the following for your information. Other conventional forms of lighting are sufficiently powerful to serve as grow lights, but the downside is that they are not very energy efficient. HPS grow lights, for instance, require much more power than LED grow lights to run effectively. So, even though HPS grow lights are not as costly as LED grow lights upfront, the cost can add up in the long run because of the higher power requirements. The same problem plagues HID grow lights and fluorescent grow lights. This is the reason why LED grow lights are the preferred choice over these other more conventional forms of lighting. In the long run, the energy efficiency of LED grow lights helps you save more money down the road. The temperature of your grow room or tent can make or break your harvest. Maintaining the optimal temperature of the room or the tent is extremely important to ensure that your plants stay healthy. HPS and HID grow lights produce an incredible amount of heat, which means you have to invest in extensive cooling systems so that you can prevent your room from overheating. With LED grow lights, you don’t have to invest so much money in cooling systems because LED grow lights have the innate advantage of remaining cool or just warm to touch even after long hours of usage. Generally, LED grow lights can last for 50,000 to 100,000 hours of use. Of course, there are a few rotten apples here and there, but broadly speaking, if you use the best LED grow lights, it is highly likely that you won’t have to replace your lighting system for years or even a few decades. In contrast, other grow light options such as the HPS grow lights and fluorescent grow lights will need to be replaced much more frequently. A relatively small LED grow lamp can emit a large amount of light. Because it doesn’t require as much equipment to run these LED grow lamps, you can free up a lot of space in your grow room or your grow tent without having to worry about the additional equipment or cooling systems that will inevitably take up space that could have been put to better use, like more space to put your plants or areas to access your plants. LED grow lights are more energy efficient, which also means that they are more environmentally-friendly. HPS grow lights, on the other hand, are less energy efficient and linked to the large amount of carbon dioxide emissions in today’s world. Fluorescent grow lights are also not the most environmentally-friendly alternative. Because they use mercury vapor and other inert gases pressurized inside the tube, they become a hazard when they need to be disposed of. On average, an LED grow light needs about 32 watts of power to cover 1 square ft of flowering plants. For vegetating plants, you will need much less wattage, about 50% less because plants in the vegetating stage do not require as much light intensity. As a general rule, you should consider the number of plants that you intend to grow in your grow room, the area that will be covered by your plants in the grow room and the recommended LED wattage for the number of plants grown in the space. Obviously, the more plants grown, and the larger the area occupied by your plants in the grow room, the higher the wattage required to ensure sufficient light intensity provided to all the plants. Depending on the make of the LED grow light, it is best to look at the manufacturer’s recommendations when it comes to the number of watts you need to optimize the growth and yield of your plants. With all this information, you are all set to buy the best LED grow lights for your needs! Now that you have a better idea of the recommended brands and models, benefits of LED grow lights and the wattage requirements, it’s time for you to get cracking!